Nifty50 gradually inched higher amid consolidation throughout session and closed higher on April 15, but failed to hold 11,700 levels reclaimed during the day. The gains were driven by banks, auto, metals and select technology stocks. The index consolidated in 11,650-11,700 zone for most part of the session. It formed a small bullish candle on daily scale, making higher highs - higher lows formation from past two trading sessions. 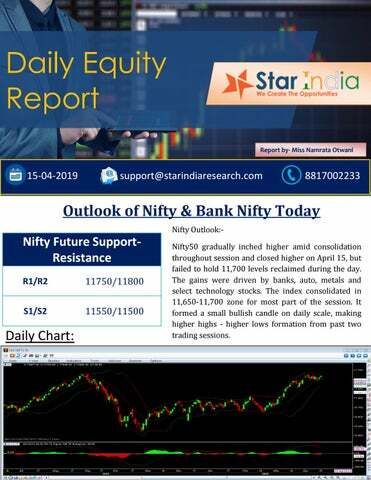 Bank Nifty Outlook:Bank Nifty managed to hold above 30,000 level and remained consolidative for most part of the day, but failed to cross above 30,250 zone. The index closed 165.70 points higher at 30,104.25 and formed a bullish candle on daily scale. Supports are gradually shifting higher. Now it has to continue to hold above 30,000 to witness an upmove towards 30,250 then 30,500 zones while on the downside major support is seen at 29,700 then 29,500 levels. Stocks Corner: 1. 2. 3. Wipro board meeting scheduled to be held on April 16 to consider a proposal for buyback of equity shares of the company. State-run Rail Vikas Nigamâ&#x20AC;&#x2122;s shares to start trading on BSE/NSE after IPO gets 182% demand at Rs19/share. As many as five companies are said to have submitted expressions of interest (Eo-Is) in picking up stakes in Jet Airways that have been put on sale by lenders as part of a rescue plan, as per ET report. Welspun Corp received additional pipe orders of 180KMT on a global basis. The companyâ&#x20AC;&#x2122;s order book stands at Rs1,661 KMT worth at Rs14,100cr. Reliance Industries clarified that the company neither setup any gas pipeline in 2006 nor has any contracts with any Netherland company for setting up any gas pipeline. Wockhardt received USFDA approval for generic version of Dacogen, which is used to treat certain forms of cancer. The product will be manufactured in Hyderabad. The company says it will launch the product in the US in a short period of time. Blue Star filed a petition for liquidation of its Oman-based joint venture in the jurisdictional court in Oman. Stocks in ban period DHFL, IDBI, JETAIRWAYS, PCJEWELLER, RPOWER, WOCKPHARMA. Technical outlook of top 2 stocks ï&#x201A;· ESCORTS Stock sustain above 20 DMA which indicates positive movement in coming session. ï&#x201A;· L&TFH FUT Stock had given breakouts of its resistance and sustain near around it buying may continue in stock. DISCLAIMER Entering our site means that you have read, understood and agreed to everything that is written and implied in this disclaimer note. RESEARCH is published solely for informational purposes and must in no way be construed as investment advice for a specific individual. The information and views in this website & all the services we provide are believed to be reliable, but we do not accept any responsibility (or liability) for errors of fact or opinion. Users have the right to choose the product/s that suits them the most. Investment in equity shares, futures, options and commodities has its own risks. Sincere efforts have been made to present the right investment perspective. The information contained herein is based on analysis and on sources that we consider reliable. We, however, do not vouch for the accuracy or the completeness thereof. This material is for personal information and we are not responsible for any loss incurred due to it & take no responsibility whatsoever for any financial profits or loss which may arise from the recommendations above. The information contained herein is from sources believed reliable. We do not represent that it is accurate, complete and it should not be relied upon as such. Any action taken by you on the basis of the information contained in this site is your responsibility only and we will not be liable in any manner for the consequences of such action taken by you. Our Clients (Paid or Unpaid), any third party or anyone else have no rights to forward or share our calls or SMS or Reports or any other information provided by us to/with anyone which is received directly or indirectly by them. If found so then Serious Legal Actions can be taken. By accessing our site or any of its associate/group sites, you have read, understood and agree to be legally bound by the terms of the following disclaimer and user agreement Star India Market Research and its owners/affiliates are not liable for damages caused by any performance, failure of performance, error, omission, interruption, deletion, defect, delay in transmission or operations, computer virus, communications line failure, and unauthorized access to the personal accounts. Research House is not responsible for any technical failure or malfunction of the software or delays of any kind. We are also not responsible for nonreceipt of registration details or e-mails. You understand and agree that no joint venture, partnership, employment or agency relationship exists between you and Research House as a result of this agreement or on account of use of our website. Price and availability of products and services offered on the site are subject to change without prior notice. We provide information about the availability of products or services to a certain extent but you should not rely on such information. 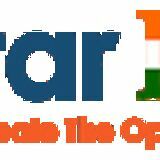 Star India will not be liable for any lack of availability of products and services you may order through the site.